This CC is equipped with a 2.0 liter 200 horsepower four cylinder engine with direct injection. Turbocharged on this one - so hold on. Power for our car came from a 2.0 liter TFSI, 200 horsepower turbocharged in line four cylinder engine with direct injection. 21 MPG city and 31 MPG Highway; fairly strong fuel efficiency for a luxury car this size. Gas mileage is rated at 22 city, 31 combined. Federal officials say that the owner of this car can save $259 in fuel costs over a five year period. We love this stylish vehicle through and through. While not a value-added vehicle, per se, it offers a remarkably comfortable and safe ride. The brakes on the CC, like many Volkswagen cars, were very sensitive - touching them w-o-r-k-s! The layout, interior, touch points and ride are not quiet glamorous, but they deliver a sophisticated service and style. While we very much like the CC, we wished more people did, as there aren't that many on the road. Redesigned in 2013, there is a lot of competition at this high $30 - 40K price point. We believe the innovative CarNet Telematics (see video below), however, is terrific, but this selling feature really has to be sold and explained very well to customers. On style and (other) merits alone, consumers may not "get" all that this car has to offer. The CC four dour is a marvelous, gorgeous alternative for those who find most family sedans to be about as interesting as a cardboard box--in other words, just about everybody else in this family car field. But luxury or not, this car is still a Volkswagen with everything you've come to love from the brand: decent fuel economy, a gorgeous interior that looks like it belongs in a much more expensive car, handling with few peers, and spot-on steering and braking. Wonderful car. Air bags galore, dual-zone climate control for customized comfort, lumbar heated 8-way power front seats, leather interior plush seating, a leather-wrapped adjustable steering wheel, Bluetooth, NAV system, and an eight-speaker sound system with a touchscreen interface, CD player/Satellite radio. Traction control. All wheel Brakes. Equipment includes side curtain protection, head impact airbags, front and rear, tire pressure monitoring system, driver and front passenger head/thorax side airbag supplemental restraint, along with more familiar items. This smooth sailor does not have all the amenities and tech features found in many of its competitive models. But - lets be clear, those other companies and models don't have the very smart, all encompassing and cool Volkswagen's Car-Net telematics - that has safety features if you are in an accident, alerts if your teenager is driving and are going over the speed limits or beyond a border, and so much more. Things start out with the Sport, then moving up to the R-Line, then Executive, a new trim level introduced for 2014 for and finally, the model line-topping VR6 4Motion Executive. The base Sport comes standard with 17-inch alloy wheels, foglights, automatic wipers, automatic bi-xenon headlights, LED taillights, LED daytime running lights, dual-zone automatic climate control, rear air vents, cruise control, heated eight-way power front seats (with four-way lumbar), leatherette premium vinyl upholstery, a leather-wrapped tilt-and-telescoping steering wheel, an auto-dimming rearview mirror, Bluetooth phone and audio connectivity, Volkswagen's Car-Net telematics, a navigation system and an eight-speaker sound system with a touchscreen interface, a CD player, satellite radio, an auxiliary audio jack and an iPod interface. The R-Line adds 18-inch wheels and special exterior styling. If you move up to the new Executive model, additional standard items for your car will include everything from the lower two models, and in addition, you get a sunroof, keyless ignition/entry, a hands-free easy-open trunk, leather upholstery, a rearview camera and an upgraded navigation system with a slightly larger screen. 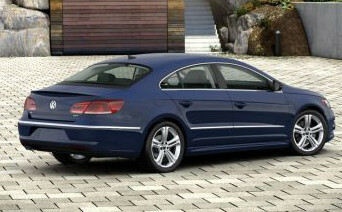 The VR6 4Motion Executive adds standard all-wheel drive, a V6 engine, front and rear parking sensors, power-folding exterior mirrors, heated windshield washer nozzles, an upgraded trip computer screen, ventilated front seats, a massaging function and memory settings for the driver seat, a power rear sunshade and a premium sound system. VW is pretty generous, too with its safety standard equipment as well. On your CC, you'll find stability and traction control, anti-lock disc brakes, front side airbags and side curtain airbags. If you get either the Executive and VR6 4Motion Executive models, you will get a rearview camera. The Executive also provides you with front and rear parking sensors. But given the price and prestige that this model offers, we were disappointed that features often found on competing products like lane changing safeguards and blind spot monitoring, couldn't be ordered on the CC. This puts VW in a competitive pickle when it comes to models from other car makers. But for 2014, you also do get Volkswagen's new Car-Net telematics system. This system does have some important elements, like automatic crash notification, roadside assistance, remote vehicle access, stolen vehicle location and geo-fencing (which allows parents to set boundaries for teenage drivers). A Car-Net smartphone app lets owners control many of these functions while you are driving. All very cool features, don't you think? Since hitting the market a few years back, this has been one of our favorite designed vehicles. Not over the top, yet stately and simple refined. The overall look and feel is luxury in and out. Our "back-seat" drivers hit their head getting out of the car a lot - its sleek aerodynamically design and angle have very little contour. Also, because of my height (five feet tall), my seat was at its highest, leaving no room and no clearance between the headrest and interior roof of car. Because the passenger headrest was almost equally as high, that impacted my vision/ blind spot. 18" alloy wheels on this CC offer a more sophisticated look. The four door coupe scene has become pretty boring as far as I'm concerned. But the CC is a classic, and can stay around as long as the company wants, in my view. It's low, sleek look is tastefully accented by the rich looking chrome pieces, and the interior is baby Audi - a very, very, very good thing. But watch out! The sleek styling can also mean trouble getting in and out, banging your head on the trunk lid and whacking yourself on the door edge. 3 year/36,000 mile limited car warranty; 5 year/60,00 mile limited powertrain warranty, 12 year unlimited corrosion perforation warranty; 24 hr. roadside assistance for 3 years or 36,000 miles. Warranty-wise, the car is covered by the usual three years, 36,000 mile limited car warranty; a five years/60,00 mile limited powertrain warranty, along with a 12 year unlimited corrosion perforation warranty; and 24 hour roadside assistance for three years or 36,000 miles.